Infinity is a fascinating idea and it is behind some of the most beautiful results in mathematics. Much of this beauty is accessible to everyone, brought to us by the brilliant Georg Cantor using simple arguments that require little math. I hope to show some of this goodness to people who haven't seen it before. Here we go. It is pretty clear that the arrangement above covers all of the rationals, but the crucial point is that Cantor's pattern will reach any given rational in a finite number of steps. The zigzag is important: if we go off in a single direction (say, across the first row to the right) then we get stuck in the infinitude of that row alone, and there would be rationals left over. The zigzag delivers us from that evil. This argument does not produce an equation for a bijection, but since it builds a listing that contains every rational number, it shows they are denumerable. Conversely, if a set is denumerable its elements can be put into a listing where each element is paired with a natural number. Irrational numbers cannot be expressed as a fraction; moreover, when written out as numbers using positional notation (say, as decimal numbers) their digits never settle into any kind of periodic pattern. Fractions, by contrast, eventually settle into a pattern when written out (e.g., 0.333..., 0.25000...). All of the rationals plus all of the irrational numbers make up the real numbers. And those guys form a number line free of holes. Any point in the number line is a real number, any crazy sequence of digits you come up with is a real number. It's the continuum. You might get the impression that irrational numbers are rare, oddballs among the familiar rationals, but that's not the case at all. The sparse number line above is an attempt at visualizing that fact, in addition to showcasing my superior preschool MS Paint skillz. The reals are a vast ocean of irrationals pointed here and there by a fraction, and we'll see why. 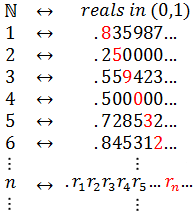 The actual numbers shown above are not important, since the complete list is infinite and has every real number in the interval. Some of the reals up there are clearly rationals and have settled into a periodic pattern (0.250... and 0.500...). The others look pretty random, they could be irrational or maybe they haven't settled into their periodic patterns yet. Either way, for each number the digits go on indefinitely, rationals in a pattern (possibly of zeros) and irrationals randomly. The digits of this number p are random and go on infinitely; it is a real number. But due to how we have defined p, it is different from every other number in the list. It differs in at least one digit. Even though the list is infinite, this number is not in it! But then, this list was supposed to have all real numbers so we have a contradiction. Hence our initial assumption must be false; the reals are not denumerable. The notion of different infinities was a revolutionary one in mathematics. It is a stunning result which ignited the mother of all mathematician flame wars. This was actually the second proof Cantor offered for the non-denumerability of the continuum. The first proof is also valid, but slightly more technical. Cantor's diagonal argument however is amazingly simple and highly original, as brilliant as its conclusion. It went on to feature prominently in other intellectual landmarks. Alan Turing used it while proving that a Turing Machine cannot predict the behavior of other machines (specifically, predict whether another machine is "cycle-free", which is now known as the Halting Problem). Gödel used it in his Incompleteness Theorem discussed in Gödel, Escher, Bach. Diagonalization is crucial in recursion theory and complexity theory. 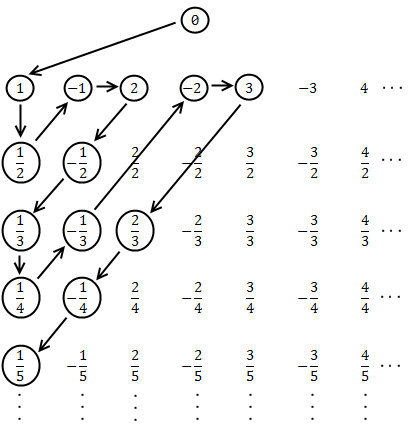 In order to capture these new concepts, Cantor proposed cardinality as a measure of how numerous a set is. A finite set's cardinality is simply how many elements it has, say 49 for our set of sheep. But the cardinality of an infinite set is expressed by a transfinite number. To make them more esoteric, Cantor used the Hebrew letter aleph for these numbers. By definition, the naturals took aleph zero, , for their cardinality. Every denumerable set has cardinality . The cardinality of the reals was defined as c, and Cantor spent years trying to discover whether c = , that is, whether the cardinality of the reals is the 'next bigger one' after the naturals. So that explains the name in Mona Lisa Overdrive and also the handle for Aleph One, who wrote the classic paper on stack buffer overflows during the Phrack renaissance. This concludes our first foray into the infinities. There's way too much to talk about. If there's interest I'll write a follow up to see where else infinity leads us. Iterative rather than upfront blogging :) Meanwhile, Journey Through Genius is a great book that does for many theorems, including Cantor's, what I did on this post. Only much better. Thanks for reading!